Sea Palling towermill was a five storey tarred red brick mill. The batter eased off for the top two storeys and the differing brickwork indicated they were a later modification. The mill was stood near the Stalham Road, beside the Mill House with small brick barns and outbuildings around a mile to the west of the village. 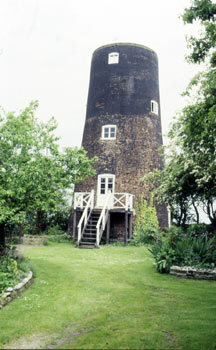 The mill had a Norfolk boat shaped cap with a gallery and 6 bladed fan. Four double shuttered sails, each with 8 bays of 3 shutters drove 2 pairs of French burr stones a flour mill (2 in 1835-6) and a jogging screen. The iron brake acted on a flat bottomed groove set in the rim of the iron brakewheel. In July 1792, William Spratt along with Stephen Spratt of Wacton mill were listed as a executors of the late John Spratt of Bedingham_smockmill and it seems reasonable to assume they were related and quite possibly brothers. Hewling Luson Warnes moved from Hemsby_towermill in 1875, where he had been for some 15 years. It is probable that Hewling Warnes was a relative of Elizabeth Warnes and it is presumed she was the widow of Henry Warnes. Thus Hewling Warnes moved to take over a mill already in the family. Now in full trade and very convenient for water carriage, with Possession at Lady next. A TOWER WINDMILL with two pair of French Stones, Jogging Screen, Flour Mill and all Going Gears in excellent repair and about one acre of Land. Also a new built Dwelling house with two very handsome front rooms, six chambers, bake house and dairy, with every convenience for a genteel family. Likewise Stables, Cow houses and Pig's Cots all brick built. The purchaser may be accommodated with a seven acre marsh if required. Apply to Mr. Henry Warns of Sea Palling in Norfolk, who will shew the Premises. N.B. Part of the purchase money may remain on the estate. Now in full trade and very convenient for water carriage, with Possession at Lady day next. A TOWER WINDMILL at Palling next the Sea, with two pair of French Stones, Jogging Screen, Flour Mill and all Going Gears in excellent repair and about one acre of Land. Likewise Stables, Cow houses, Piggeries and other necessary outhouses, all brick built. The purchaser may be accommodated with a seven acre marsh if required. Apply to Mr. Henry Warns, the proprietor, on the premises or to Mr. Chalker, Solr. North Walsham. A TOWER WIND-MILL situated at Palling near the Sea, with two pair of French Stones, Jogging Screen, Flour Mill and all Going Gears in excellent repair and about one Acre of Land. Also a new brick built Dwelling house with two very handsome front rooms, six chambers, bake house and dairy, with every convenience for a genteel family. Likewise a stable, cow houses and pig-cots all brick built. 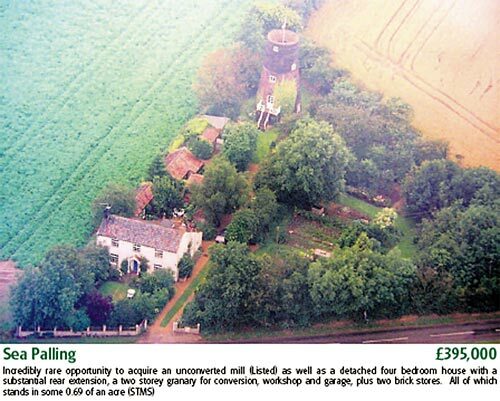 Apply at Palling Mill near Stalham, Norfolk. Henry Warnes let the mill for several years in the 1820s and 1830s while he rented and worked Horsford_smockmill and then Dilham_watermill. An excellent TOWER WINDMILL capable of Manufacturing 4 or 5 lasts per week with two pair of French Stones, flour mill complete going gears. Also a comfortable Dwelling house with granary, requisite outbuildings and about one acre of land. The Premises are situate in a good neighbourhood and are within a quarter of a mile of the navigable river to Yarmouth. For rent and further particulars apply to Mr. Henry Warnes, Horsford or to SEWELL, BLAKE & KEITH, Solrs. Norwich. A capital Brick TOWER WINDMILL at Palling next the Sea, carrying two pair of French Stones with Flour Mill and Going Gears complete. Also a neat Dwelling House with Granary, stable, cart lodge, piggery and other outbuildings and about one acre of Arable land adjoining the Mill. The above Premises are within a quarter of a mile of water carriage and are now in the occupation of Mr. John Gambling who will quit the same at Michaelmas next. Apply (if by letter post paid) to Messrs. SEWELL, BLAKE & KEITH, Solrs. Norwich. A comfortable SMALL DWELLING HOUSE with stable, cart shed and other convenient buildings and a Brick Tower Windmill with two pair of French Stones, two flour mills with going gears complete; also a good granary and about one Acre of Land. The Property is at Palling next the Sea in Norfolk and is in the occupation of Mr. James Scarland. Apply to Messrs. SEWELL, BLAKE & KEITH & BLAKE, Solrs. Norwich or Mr. Henry Warnes at Dilham_Mills near North Walsham. TO BE LET With Possession at Michaelmas next. With good Dwelling house, requisite Outbuildings and an acre of Land adjoining and now in the occupation of Thomas FRARY. The Mill drives two pair of French Stones and two Flour Mills. Apply to SEWELL, BLAKE & CO. Solrs. Norwich or to Mr. Warnes at Mr. Wells' Dilham_Mills. To be Let with possession at Michaelmas next. A Windmill with two pair of stones and going gears complete, together with a dwelling house, granary and suitable outbuildings, and about an acre of land at Palling, next the Sea. Apply to Mr. Warnes Dilham_Mill. To be Let with possession at Michaelmas next. 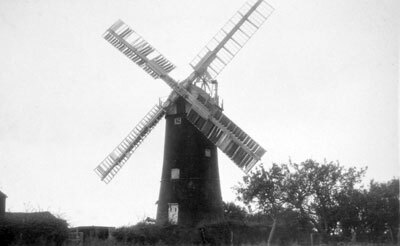 A Windmill with two pair of stones, Two flour mills and going gears complete, together with a dwelling house, granary and suitable outbuildings, and about an acre of land at Palling, next the Sea. Apply to Messrs. SEWELL, BLAKE & Co. Solrs. Norwich. 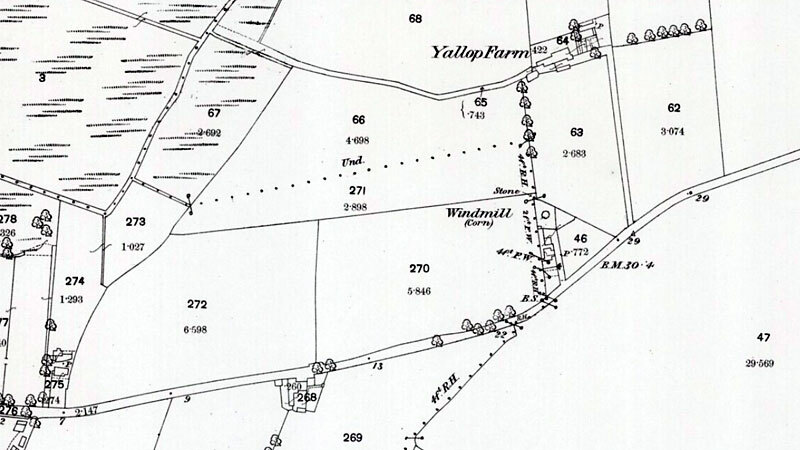 Capital Windmill at PALLING NEXT THE SEA and Cottages at Winterton To be Sold by Auction by Mr. Wm. Butcher at the White Horse Inn, Great Yarmouth on Wednesday 30 August 1843 at 2 o'c. Lot 1. A Capital Brick TOWER WINDMILL well situate for trade, driving two pairs of French stones with winding tackle, flour mill and going gears complete and in good repair. Also a comfortable Dwelling house ... yard in which are a granary, stable, cart lodge and piggeries together with a good garden and piece of Arable Land attached containing altogether including the site of the buildings one acre more or less. All Freehold and no outgoings. Apply to Messrs. SEWELL, BLAKE, KEITH & BLAKE, Solrs. or the Auctioneer, Norwich. Hewling and Luson were actually surnames that had been given as forenames to try and ensure the names survived as long as possible. Luson was a big merchant in Yarmouth, with malthouses, granaries etc. in the early 1700's and Hewling was on the manor court rolls for Shropham, having deeds from another man. There was a lot of money in the earlier years and perhaps landowners of considerable property on both sides. A BRICK-TOWER WINDMILL, with patent sails, driving two pairs of stones and two flour mills, having a convenient Dwelling house and requisite Outpremises, with Garden and Pightle of Land adjoining at Palling next the Sea. There is a good connection to the Mill, which is now to be let in consequence of the decease of the late Manager. For particulars apply to Mr. J. Dawson, Martham or to Mr. H. L. Warnes, Hemsby, Norfolk. Charles Feltham on Tuesday October 13, 1868, the Household Furniture ... Dairy and Brewing utensils, Miller's Carts ... Agricultural Implements and other Effects of Mrs. Elizabeth Warnes who retires from business. On account of the number of Lots, the Sale will commence at 11 o'c punctually. To Millers. To be Let with immediate possession all that capital and long established MILLERS BUSINESS so prosperously conducted by the late Mr. Henry Warnes and afterwards by his widow comprising a powerful brick-built TOWER MILL driving two pair of stones, with patent sails and self winding gear, a commodious Dwelling House, Pightle of Land, Gardens, Storehouse and other suitable Outbuildings and Trade Premises. Apply to Mr. Clowes, Solr. Great Yarmouth. For Sale by Private Contract. All that capital BRICK TOWER WINDMILL driving two pairs of French stones with Winding Tackle, Flour Mill and Going Gear complete. Also substantial and commodious Dwelling House with Yard, Granary, Stable, Cart lodge and other Outbuildings together with good Garden and piece of Arable Land attached, all Freehold and now in the occupation of the Executor of the late Mr. Henry Warnes deceased, who will give immediate possession. The Mill stands in a fine position to command a trade and connection and is admirably situated as regards wind. A TOWER WINDMILL driving two Pair of Stones, with Dwelling house, Outbuildings and Pightle of Land, situate at Sea Palling. A TOWER WINDMILL driving two pairs of Stones, with Dwelling house and Pightle of Land, situate at Sea Palling. Brick tower windmill admirably situated for wind in district quite away from other mills, doing about 2600 coombs of "Bags" yearly, besides the flour business: also a comfortable Residence with warehouse, stable, cowhouse4 and all requisite buildings, gardens and pightle of pasture land. To sell by auction ... all that well-built Brick Tower WINDMILL and the messuage or Dwelling House with the yards, gardens, granary, stable, cart lodge and other out-buildings and the pightle of land adjoining thereto situate at Palling-next-the-Sea and now in the occupation of Mrs. Smith. and the Messuage or DWELLING HOUSE with the Yards, Gardens, Granary, Stable, Cart lodge and other Outbuildings and the Pightle of Land adjoining thereto, situate at Palling next the Sea, Norfolk and now in the occupation of Mr. Warnes as Manager for Mr. Smith. Possession will be given on completion of the purchase. 17 Bank Plain, Norwich, Vendor's Solrs. now in the occupation of Mr. Warnes as Manager for Mrs. Smith. My parents bought this windmill in the early 1960s (around 1962 or 3) and used the house as a weekend home. the windmill was derelict and the house wasn't much better, so all their attention was devoted to the house (they ran a restaurant in Harlow and we used to set out after the Sunday lunch serving for the three-hour journey, leaving at the crack of dawn to get me to school in Bishop's Stortford on Monday morning, so you'll see there was little time for renovations. they eventually retired there in 1971, but as is often the way, my father died within months. my mother stayed on for a little while, selling the house in 73 (which you note on your site). she was very reluctant to move, but was persuaded by my sisters and myself - we thought we knew best and didn't. 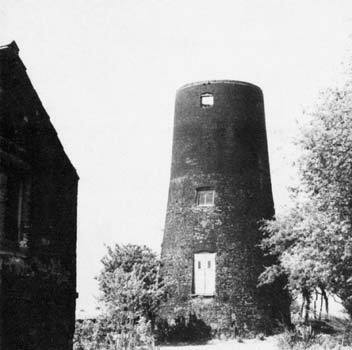 1979: Mill lying derelict with no roof.